Animals are founding it harder to live and survive in this world where man has declared himself king of nature. We eat them, use them for our own purposes during war and in the police, we strip off their skin to meet our taste for fashion.But look how they are defenseless, selfless and innocent. Should we not relate to our younger brothers with great attention, help and protect them? After all, they make us show our best feelings and be a little bit kinder. All these moments in life that so delight and amaze us invoke deep emotional experiences. We can see only through photographers, many of whom we don’t even know. However, these were people with cameras that happened to be in the right place at the right time. Perhaps you can give bright emotions to many people if you have a camera and know how to take pictures. 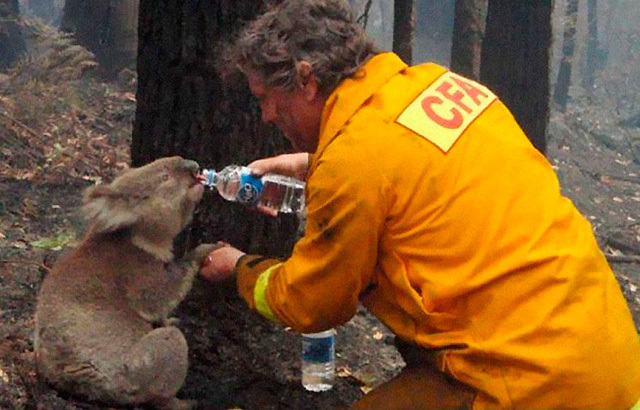 A firefighter gives water to a koala during the devastating Black Saturday bushfires in Victoria, Australia. Forest fires in the Australian state of Victoria in February 2009 led to at least 181 deaths and destroyed thousands of homes, especially in the town of Kinglake and its vicinities. These fires claimed the greatest number of lives in the history of fires in Australia. 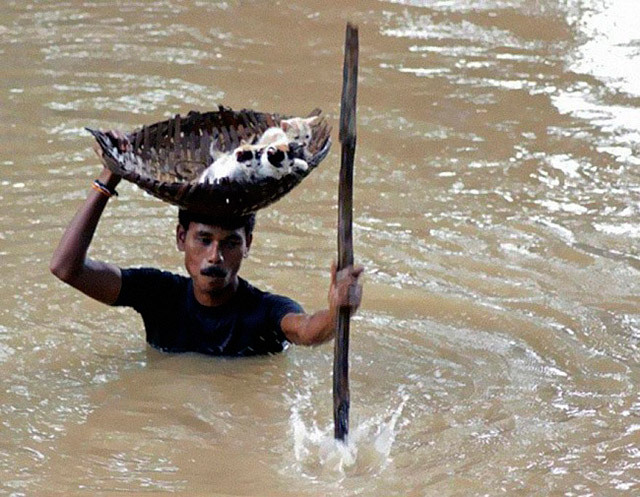 During floods in Cuttack City, India, in 2011, a local resident saved numerous stray cats by carrying them with a basket balanced on his head. 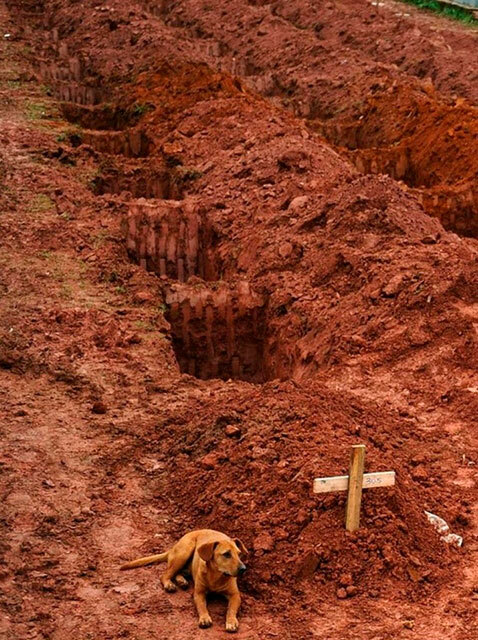 A dog sits for a second consecutive day at the grave of her master, who died in the landslides not far from Rio de Janeiro in 2011. 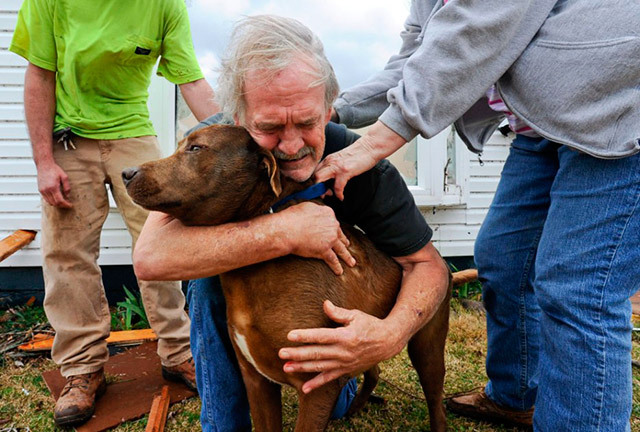 Greg Cook hugs his dog after finding her inside his home in Alabama, destroyed by the tornado in March, 2012. This dog has saved thousands of lives during a series of explosions in Mumbai in March 1993, she discovered more than three tons of explosives, 600 detonators, 249 hand grenades and 6406 rounds of ammunition. The dog was buried with full honors in 2000. 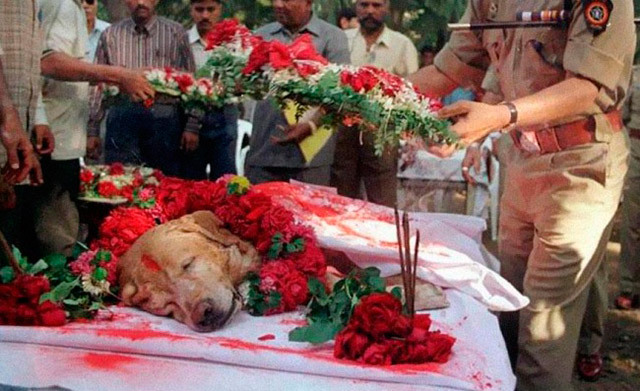 In India, the dog Zanjeer was buried with full honors. He saved thousands of lives during the terrorist attacks in Mumbai in 1993, finding 3329kg. RDX and other explosives. 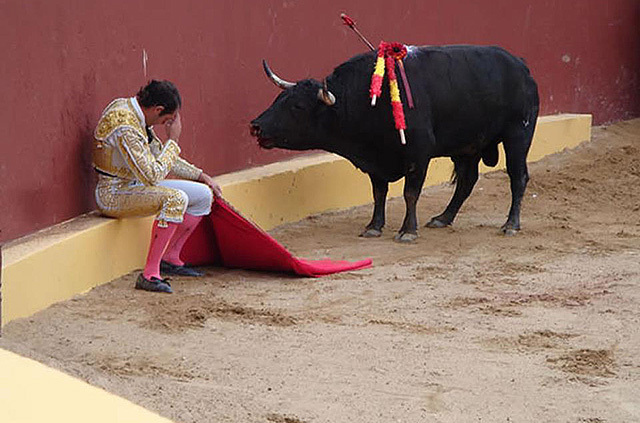 Alvaro Munera, who unexpectedly realized the cruelty of bullfighting. “Suddenly, I saw no horns, and the bull’s eye. He stood in front of me and looked at me. Simply stood and watched, making no attempt to attack. 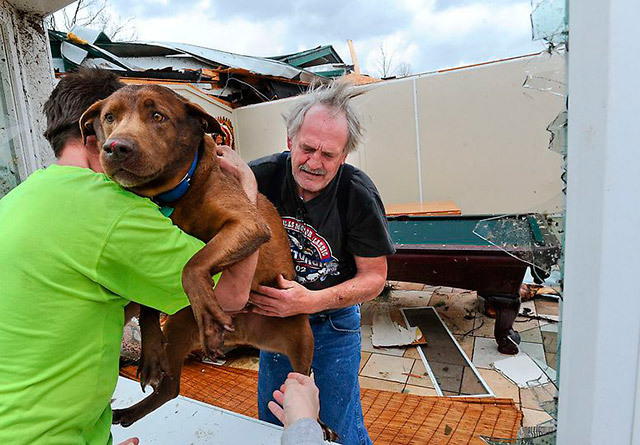 Innocence that all animals have in their eyes, looked at me with a plea for help”. Lucas Hembree and his dog Juno. 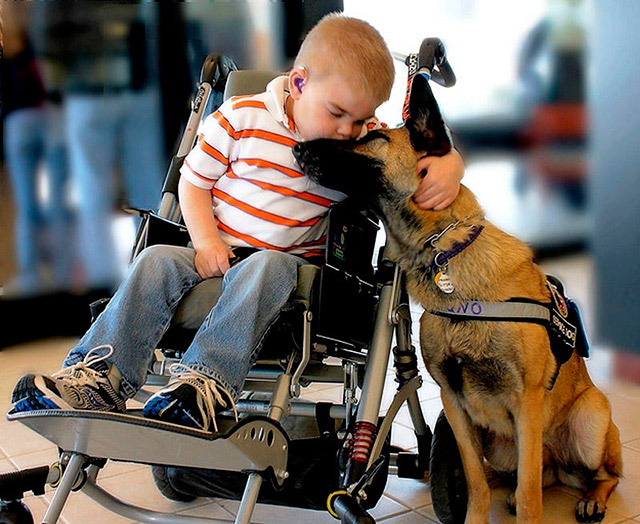 When former law enforcement officer Chester Hembree was told that his son Lucas, who suffers from Sanfilippo syndrome, was a poor candidate for a service dog, Chester took this dog Juno from a Tennessee shelter and trained him to be a service dog by himself. 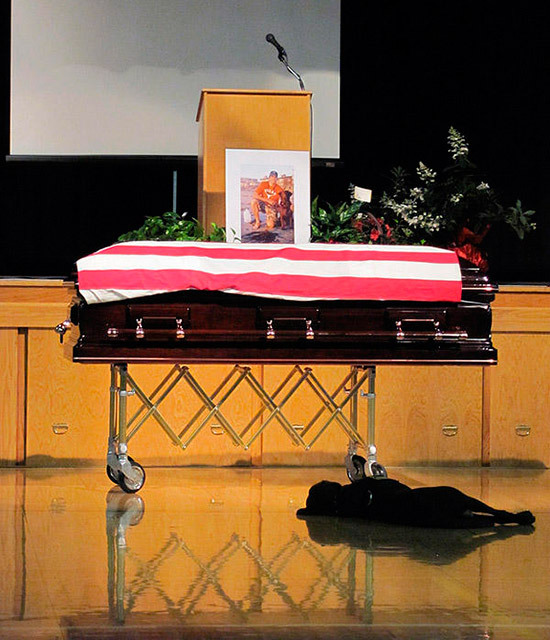 Dog mourns his dead owner, a Navy SEAL. Hawkeye a faithful four-legged friend of navy seal Jon Tumilson laid by the casket of his fallen master for the entire ceremony. Now the dog lives with Tumilson’s good friend, Scott Nichols. This was Jon’s will. Jon Unger holds a water therapy session for his arthritic dog – 19-year Schoep. The buoyancy of the water calmed the dog and made it fall asleep in the hands of his master. 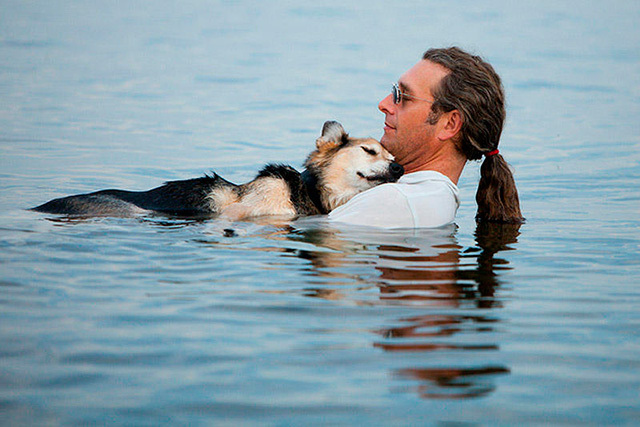 A touching image featuring the dog and his owner, John Unger, sharing a peaceful moment in the water soon swept across the web, and people from across the globe started donating money for the operation and medication for Schoep. Jon spent all the remaining money in establishing a Charity Foundation for animals. Schoep lived a long life with a caring and loving owner and died at the age of 20 years. Sergeant Frank Praytor feeds a two-week-old kitten named Miss Hap (due to the unfortunate circumstances of her birth). 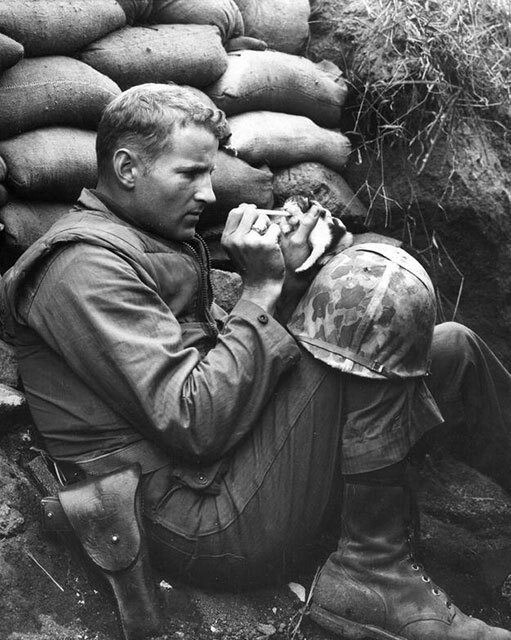 Frank, after learning how the photo gained popularity, said that the kitten was one of the two, whose mother was killed by another soldier because of her loud yeowling. The other kitten was accidentally crushed by a sleeping soldier. Such was the sad story. Miss Hap survived and as Praytor said, another soldier, corporal Conrad Fisher took her along with him to the States.